16	The boon and necessity of entrepreneurial failureâ&#x20AC;¦ 22	Santhigiri Ashram The divine spiritual-centre of peace and equality 26	CROSS ROADS 32	How volumes and price plays an important role in decision making? ATA, a global airline association, has raised objection on the new airline policy introduced by the government. The policy states that the tariffs of all airports will be valued on a hybrid-till basis in order to grab more profit. The airline association is planning to meet respective authorities seeking clarity in the new said policy. They suspect that the policy will negatively affect the private airline sector functioning in the country. It is said that the new policy will eventually led to travel price rise. It will make air travel even more expensive. he South Delhi Municipal Corporation is planning to launch an innovative energy programme by installing the solar panels. It is said that the corporation will install the panels in schools, offices, community centres, hospitals and other buildings situated under their territory. The corporation requested the assistance of the Solar Corporation of India to implement the project. They have officially reached an agreement with the same. It is estimated that it would cost around 100 crore rupee to implement the project successfully. Anyway, the local authorities will get a huge subsidy of over twenty five percentages to implement the project. he premium hatchback Baleno, launched by the automobile giant Maruti Suzuki, has racked up impressive response from the customers. It is said that the company has ramped up the production of the hatchback to meet the rampantly growing demand. The source reveals that the company is keen to reduce the waiting period for maintaining the positive response. It added that its parent company, Suzuki, is set to start pilot production in its Gujarat unit from early next year. Till now, the company has over half lakh outstanding booking for this product. The conglomerate announces a six month waiting period for this product. he centre government has approved start-up fund programme to provide strength to the Start-up India programme. It is a huge fund with a corpus of nearly ten thousand crores. Through the Start-up India plan, the government is expected to generate at least eighteen lakh job-opportunities in the country. The government had earlier made announcements regarding the fund during the 2015 budget session. The authorities had already earmarked around five-hundred crore in the budget 2015. Subsequently, in the budget 2016, the centre had again provided six-hundred crore to the fund. he Indian software conglomerate, Tech Mahindra, has acquired the UK-based digital transformation giant, BIO. Tech Mahindra is the fifth biggest software exporter in our country with a huge client base and sustainability rate. The BIO agency is concentrated in digital transformation across different sectors including finance, retail, and travel. The new move made by the tech tycoon will help them to strengthen digital sector. It will help provide better digital experience, strategy, and customer service. It also helps make concreate achievements in the telecommunication sector of the company. he Income Tax department would take strong action against the wilful defaulters, says the Central Finance Minister, ArunJaitly. Meanwhile, he asserts that the government would only encourage action against those people whose names has been published by the IT department as wilful defaulters. It is learned that presently there are around sixty-three names in the list published in the IT department’s official website. As per report, the IT department regularly posts the names of those people who intentionally act reluctance to pay money in order to ‘name and shame’ them. The list posted in the IT’s official website will contain name, address, PAN number, amount, and source of income of the defaulter. Later, in 2010, we instituted the annual V.C. Padmanabhan Memorial Awards for Excellence to honour distinguished personalities for their outstanding contributions to society. Shri V.P.Nandakumar, MD & CEO, Manappuram Finance Ltd.
Pvt. Ltd.) to deliver the lecture before a select, invited audience. This year’s lecture was delivered by Shri P.N. Vasudevan, MD of Equitas Holdings Ltd., the man behind Equitas Microfinance who spoke on the topic of “Microfinance and Poverty Alleviation”. Later, in 2010, we instituted the annual V.C. Padmanabhan Memorial Awards for Excellence to honour distinguished personalities for their outstanding contributions to society. Over the last six years, these awards have acquired prestige and become an important event in the calendar. Prominent personalities who have accepted the awards in previous years include Dr. E. Sreedharan (MD, Delhi Metro), Shri Vinod Rai (Former CAG), Shri M. Damodaran (Former Chairman, SEBI), Ustad Amjad Ali Khan (renowned musician) and Shri Adoor Gopalakrishnan (internationally acclaimed film director). This year’s awards carried a cash prize of Rs.2 lakhs and a bronze plaque. Prominent winners for 2016 included the eminent Malayalam novelist and screenplay writer Padma Bhushan M.T. Vasudevan Nair, the noted environmentalist Padma Shri Dr. Sunita Narain, and former Union Minister and Member of Parliament Prof. Traditionally, in most pockets in India, the stigma attached to entrepreneurial has been immense. Parents of yesterday, would prefer their children to pursue a career in a professional stream like engineering, medicine, finance (banks) or education. Failures are not really setbacks, it is a result of an experiment that did not give you the necessary results. It just clarifies on what to change and modify in your next try! mindfulness and fear begets success! The issue of fear is not just about how we deal with it but how others deal and opine on our failures. Entrepreneurship has been getting its due in the west for more than a century now. The cultural acceptance of an entrepreneur, has driven the best minds to start organisations which have become epitomes of creativity and innovation. Much to this success has to be attributed on how we condition ourselves to failure and how the society perceives entrepreneurial failure. Traditionally, in most pockets in India, the stigma attached to entrepreneurial has been immense. Parents of yesterday, would prefer their children to pursue a career in a professional stream like engineering, medicine, finance (banks) or education. Entrepreneurship has been somewhere connected to ‘unbridled avarice’ as if it is the path followed by someone who wanted to make more wealth than what is necessary or perhaps as someone who lacked the scruples of an honest professional. In this context, when an entrepreneur fails, those around him displays a silent ‘schadenfreude’ – German word which means ‘deriving pleasure in someone else’s misery! The hoi polloi believed that this is providence coming down as nemesis on someone who took the ‘easier route’! But this is changing now in India! as infectious. We love to see and follow with the ‘fire in the belly’, who have the gumption to stay the course. A single experience should never teach you to take honesty and integrity lightly. Integrity and value systems are important for a professional. come what may! This is also not an easy task. It will seem that at times that our will power is a finite source and we have just depleted it. But picking yourself up and moving on and, more importantly, having learnt something needs an open attitude towards the problem. We can’t stop blaming the external forces – remember, often, the best response is within your reach. n this era of intolerance and violence, a spiritual center situated in the rural Kerala at Pothencode in Trivandrum district is whole heartedly dedicating itself to propagate peace and equality. Instead of forcefully insisting its followers to embrace peace by blindly following Vedas, it is guiding everyone irrespective of religion, cast or class for acquiring peace through service, ‘Karma’. Showing respect and mercy to the co-inhabitants on the mother earth, the Ashram concentrates its service in three pillers, including ‘Annadanam’, ‘Athurasevanam’, and ‘Athmabodhanam’. Apart from the core services, it extensively contributes to the society through social, spiritual, welfare and cultural activities. The Ashram was founded by Navajyothi Sree Karunakara Guru in 1964 as a charitable, non-religious, organization to fight human sufferings. Guru taught his disciples the language of global peace, saying ‘the religion I believe is of Friendship, Brotherhood, and Truth’. Our biggest achievement is that we got an opportunity to work among the poor people of the society while propagating the message of humanism. Through the educational schemes, the Ashram is trying to support underprivileged people from lower social sector. These schemes are aimed at providing financial and moral support to the poor students. shall be followed scrupulously in all matters Sishyapoojitha Janani Amritha Jnana Thapaswini is the present spiritual head of Santhigiri Ashram. There is no difference between Guru’s ideologies and Ashram’s activates. The Ashram is totally obliged to propagate Guru’s ideologies. Each and every activity of the ashram is based on Guru’s vision. Guru has gifted us a good lifestyle, specifically a humanistic life-approach. It is said that the Ashram is helping underprivileged people though several health schemes like Karunyam National Health Care programme and Accidental Relief Operations, and is still consciously following traditional medical techniques, medicines and procedures. Kindly say few words about the Santhigiri medical institutions, medical-schemes and their contributions? We cannot perfectly follow the traditional medical techniques, medicines and procedures. In this modern era, we may be compelled to dilute traditional system due to several factors including unavailability of the raw materials like medicinal plants. No one can completely assure you that their organisation is strictly following traditional medical system. Anyway, we, as a policy, try to provide traditional medical procedures, techniques and medicines. Santhigiri Ashram is actively participating in the socio-cultural activities of our society. Kindly say few words about this? are slowly embracing this kind of activities. Traditionally, the society has pasted certain limitations over the socio-cultural activities of an Ashram. Normally, preponderance of our society is observing the activities of Ashrams through a prejudiced mind. So, they possess negative pictures on their mind. Through our dedicated participation, we have managed to create acceptance in the society. The spiritual-leaders and religious scholars are one of the inevitable elements of the society. These people must work among the lower section of the society, instead of living in elite houses and palaces. It is the high time to teach secular ideologies and their relevance. Our biggest achievement is that we got an opportunity to work among the poor people of the society while propagating the message of humanism. It is learned that Guru’s ideologies is gaining greater acceptance in Gulf countries and European countries. 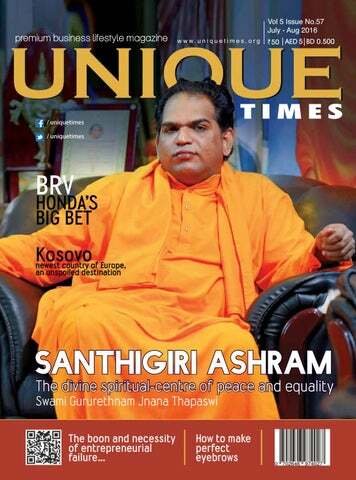 Kindly say few words about the global-expansion activities of Santhigiri Ashram? It is important to learn rules and regulation of road use. A twenty meter gap is essential before you overtake from behind a heavy vehicle. This gives you full view of oncoming vehicles on opposite side. in car, then their safety is in your hands, when you are driving. Do not indulge in entertaining all passengers inside the car. Refrain from involving into their conversations. Your attention and focus on road must be undivided, especially on high way and at high speeds. tive at all times that youâ&#x20AC;&#x2122;re driving. While you drive is not the time to be surprised, shocked or even spontaneous. In India cows and dogs too can be walking astray on to the road. Your judgment of speed or even about a pedestrian running across the road is crucial. Medians that seems to popup in the middle of the road, must be expected. Especially two wheeler drivers must be warned before overtaking a heavy vehicle, that they do not run or bump on to a sign board or an upright median in the middle of the road. Driving is not for adrenaline rush, competition or not even for hurry. Road use must be restricted to an extremely disciplined activity of traveling safely. In India, deaths because of traffic accidents are alarming. Under age must be restricted from driving. Many under age people learn to drive out of practice. They may not have gone to the driving school, and learnt the appropriate academics of road use. In this case that you do not know the academics and signages of road use, then it is you who are a danger to other road users. eet Jeslet Ajith who has completed 22 years of employment with the Metropolitan Hotel group in Kochi. She joined the Metropolitan hotel as a House keeping staff and through her hard work and commitment, climbed up the career ladder. She is currently the Head of Housekeeping department in Beaumonde The Fern, the flagship hotel of KGB Group. Beaumonde The Fern is Keralaâ&#x20AC;&#x2122;s only Ecotel, famous for its environment friendly policies. known and the same was frequently mentioned in board meetings. Her long term association with the hotel also made her like a family member for the directors. The Managing Director of Beaumonde the Fern, Deepak Sathyapalan remembers that he was around 10 years old, when he first met her. He also said that her working style and commitment was praised during family get-togethers. Kochitalk had a short talk with Mrs Jeslet Ajith in a little time she found to spare between her hectic schedules. She remembered she joined the Metropolitan in 1994. The Metropolitan was then a three star hotel, a prominent one in Kochi. It was there she learned the basic housekeeping chores. She vividly remembers former directors and their commitment to customer service and experience. She says that her career and in fact her life is invariably indebted to the KGB Group. In fact she met her husband Mr Ajith, who was then working as the accountant in the hotel. In her talk she also mentioned how the hotel policies on customer care, helped her in career. When asked about the change in hotel industry she answered that core commitment of customer service, satisfaction and experience has remain the same and may be only the peripheries have changed. In the earlier days there was far less competition, but these are the days of cut throat competition. Beaumonde The Fern being a Five-star hotel and an Ecotel increases her responsibility. She has to implement the Ecotel values to in the house keeping policies. The values include cost control, usage of day light, renewable sources and of course environment friendly products for housekeeping. a sector and in a group, her advice to youngsters in the sector is stay committed to the job, instead of jumping jobs for meagre hikes. She trains youngsters to grow as professionals in the industry. She even hires young people who are not that fortunate to have a formal education like hotel management and help them evolve as professional employees of the organization. In 22 years she has learned to perfectly manage one of the busiest hotels in the city and to her home as well. 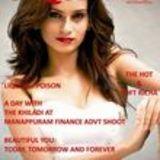 She leads a happy life with her husband Ajith and two schoolgoing daughters. She is all praise for the support of the management who helped her build her career and home. olume is one of the major indicators which helps market players who are trading in stocks to make decision. It shows the total number of shares, traded in the exchange within a specified market time. It is the additional significant parameter to judge the potential of a stock after price levels. Many traders consider the volumes data and the price chart of a stock together while taking a position in a particular stock. Let us see why volume of the stock is so important in judging the potential of the stock through two most widely used theories. This article examines the fact that why volume of the stock is so important in judging the potential of the stock through two most widely used theories. How volumes and price plays an important role in decision making? The in-depth analysis of volume and price is essential to understand the future price of the stock. day. This indicates all the big players in the counter haven’t traded on the breakout day and the price move may not last long. Big traders will trade on next trading day, with bearish outlook on the stock. This selling pressure has the capacity to generate pain for the stock. Indeed, the stock is set to fall. On the other hand, if Reliance has traded 8 lakh shares on the particular break out day (which is more than daily averages of 6 lakh shares); it means people at large anticipate the price raise in the stock. Such a break out day usually signals a genuine price breakout and in such cases one can take position depending on the break out side. This price volume breakout theory works well for positional traders, in particular almost 80% of the time in our Indian stock market. In short, volume is a grave factor in technical analysis. It is used to confirm trend and chart pattern. Any break in support or resistance level is not valid unless it is been backed by high volumes. Volume should move along with the trend. If prices are moving in an upward trend, volume should increase, and vice versa. If the previous relationship between volume and price movements starts to deteriorate, it is usually a sign of weakness in the trend. For example, if the stock has uptrend, but with lower volume, it is a sign that the trend is starting to lose its legs and may soon end. Price and Volume theory: Trend in ‘Price’ and ‘Volumes’ combines percentage price change, and volume in an attempt to confirm the strength of price trends or through divergences, counsel of weak price moves. Unlike, other price-volume indicators, the Price Volume Trend takes into consideration the percentage increase or decrease in price, rather than just simply adding or subtracting volume based on whether the current price is higher than the previous day's price. same trend in price, it is usually a sign that the downward run is about to end, and up trend is about to start. Conclusion Volume and price of the stock have immense importance in forecasting the trend for the stock, in particular and market in general. If registration requirements are not met, the promoters cannot advertise, market, book, sell or offer for sale, or invite persons to purchase in any manner in the property. would preferably be the Secretary of the department dealing with Housing. (ii) Establishment of Appellate Tribunals: Similar to the above stipulation, under Section 43, Real Estate Appellate Tribunals shall be formed within a maximum period of one year - by April 30, 2017. It shall also appoint an interim appellate tribunal in the meantime. (iii) Framing of Rules: Under Section 84 of the Act, the state governments are required to make rules for the implementing the provisions of the Act by October 30, 2016. A Committee chaired by Secretary (HUPA) is currently working on formulation of Model Rules, which would act as guidance for States and Union Territories. According to the recently passed â&#x20AC;&#x153;The Real Estate Act, 2016â&#x20AC;?, the Real Estate Appellate Tribunals shall be formed within a period of one year. This appellate tribunal and the Authority shall be bound to follow specific timelines for adjudication of disputes. Upon their formation, the Authority and the appellate tribunal shall be bound to follow specific timelines for adjudication of disputes. The disputes shall be adjudication with sixty days by both the Authority and the appellate tribunal. Method Cook pasta in a large saucepan of boiling salted water, following packet directions until tender. Drain. Meanwhile, heat oil in a large, deep frying, pan over medium heat. Add onion. Cook for 3 minutes or until softened. Add garlic. Cook for 1 minute or until fragrant. Add tomatoes and sugar. Bring to a simmer. Cook, stirring occasionally, for 5 minutes or until slightly thickened. Add coriander leaves and pasta to tomato mixture. Put the dressing ingredients into a small saucepan and bring to a boil. Remove from heat. Cook the pasta, according to the directions on the pasta package. Drain. Toss with dressing. Stir together the cooked pasta and the dressing in a large bowl until the pasta is well coated. Cover and chill for several hours. Stir in cilantro, peanuts, onions, bell pepper. Mix in the cilantro, peanuts, green onions and bell pepper. Heat oil in a large saucepan over medium heat. Add onion, carrot, celery stalk. Cook for 10 minutes or until onion has softened. Add tomato, zucchini, chicken stock and 5 cups water. Bring to the boil. Add barley. Reduce heat to low. Simmer, partially covered, for 40 minutes or until barley is tender. Chop reserved celery leaves. Stir into soup. In a bowl mix the flour, salt, and oil. Add about 1/3 cup of water to make dough, and add remaining water as needed to make smooth and pliable dough. Knead the dough on a lightly greased surface. Cover the dough, and keep it aside for at least 15 minutes. For the filling, mix the cashew nuts, coconut, cinnamon, and sugar, and set it aside. Knead the dough again, and divide it into 4 equal parts. Roll the dough into 3 inch diameter circles. Place about 3 tablespoons filling mix in the centre. Seal by pulling the edges of the rolled dough together to make a ball. Proceed to make all four balls Heat the pan. First lightly roll the filled ball in dry whole-wheat flour. Lightly press the ball on the sealed side, and keep it on the topside when rolling. Roll the ball light handed in to about 7-inch circles. Whenever the dough sticks to the rolling pin or rolling surface, lightly sprinkle dry wholewheat flour on both sides of the semi-rolled paratha. Place the paratha over the pan. After a few seconds you will see the paratha change colour and puff in different places. At this point flip the paratha over. You should see some golden-brown spots on the topside. After a few seconds, spread about1 teaspoon of oil on the Paratha. Again, flip the Paratha and lightly press the puffed areas with a spatula. omen have different streaks above their eyes. Some have thin while others have thick eye brows. You may look at pictures of Deepika Padukone and Priyanka Chopra, eyebrows play a major role in their looks. the matters into your hands and use the eyebrow pencil. Use black or brown colour. Draw it along the dark region of your eyebrows, and make sure that it does not come outside the outline. Also, ensure that it doesn't spread as too dark eyebrows can get bad rap. The eyebrows play the role as the outline of the eye shape, at the same time it says a lot about one's personality and emotions. The eyebrows are noticed when you look at one's eye, a woman's beauty lies in her sparkling eyes, so having a perfect eyebrow makeup is necessary. Getting your eye brows done is a process of patience and requires a good hand. 3. Brush it: Brush it well using the brush side of your tool. Do it thoroughly covering the hair region uniquely spreading the colour over the dark as well as light areas. Do not use your fingers as it will spread. Wipe off the spreading using a cotton soaked in water with steady hands. Pristina, the capital city, is a worthy stop on the long Kosovo tour. The city is filled with ancient mosques, new government buildings and medieval monuments. he newest country of Europe, Kosovo, is a fascinating land with historic towns, villages, ancient Serbian monasteries, and, most notably, unspoiled countryside. The country had declared independence on 2008, even though Serbian government has not recognised the country. So far, around one-hundred and eighteen countries only accepted the existence of this country. nowned Ottoman Empire is the most-fabulous tourist location. Notably, the UNESCO has marked the location as one of the World Heritage Sites. Apart from this, here we can find several other interesting locations like Kaljaja- Prizren Fortressand Shadervan- city square. If you are still keen to explore more ancient buildings and heritage sites, you must visit Peja. Rugova Canyon is the most fantastic tourist attraction in the region. Yearly, thousands of tourists are travelling into the country for exploring the 25 km long canyon. Moreover, it is a treasure land with World Heritage sites like Patriarchate of Pec, and ancient mosques and churches like Bajrakli Xhamia- a fifteen century mosque- and orthodox patriarchy church. Apart from that, you can explore cheese market which is a worthy place to spend some money. Built on the same platform as the Brio, Amaze and Mobilio, the BRV is actually a jacked up MPV with revised front end and body claddings. The front end styling gives it suitable ruggedness when viewed head on. good in terms of space, but regular adults will have to sit knees up. Equipment levels are where Honda could have paid more attention to. While there is the usual automatic climate control, keyless entry and folding outside mirrors, there is no touchscreen or reverse camera or rear parking aids. The audio system is a basic one and not something that belongs on a car that costs this much. There is no cruise control or ESP on offer and at best, you get ABS and two airbags. Powering the BRV are two familiar 1500cc engine options – a very tractable diesel and a refined petrol, the latter of which, is available in both manual and automatic variants. The diesel will be the preferred choice of those who travel long distances and it is the familiar 1.5 litre 100bhp and 200Nm i-dtec unit. Mated to a 6-speed manual, it is a very drivable unit that pulls from idle revs. There is very little turbo lag and gearshifts take little to no effort. It isn’t very refined, but if that’s your priority, the 115bhp petrol engine is perfect for you. The BRV gets a six speed manual transmission, which we believe, will soon be made available in the City too. This slick unit with its light clutch and good low end performance makes the petrol BRV good around town. For those who want the ultimate in city ease, there is an automatic variant on offer. This CVT box with seven stepped ratios comes with paddle shifters too and is very good at city speeds. It is only when you demand faster acceleration that it raises the engine revs too much and makes the car feel strained. t is a perfect budget semi-SUV for the middle class Indians from Suzuki. It will carry the 1.2 litre K-series pistol engine and the 1.3 litre DD is diesel engine. The car was initially unveiled at Geneva Motor Show on last year. his stylish luxury car is set to mark a global launch. It was initially announced at Auto Expo 2016. The manufacturers are eyeing at growing luxury-car market in the country. They offer world class luxury experience to their customers. his is the performance-oriented version of the Bolt series. The car ensures more power and stylish-look. It was unveiled at the 2015 Geneva Motor Show on last year. oyota is set to conquer the Indian automobile market with a new stylish MPV. After the immediate success of Qualis and Innova, now they are planning to test their fortune with Toyota Hiace. It is offering advanced luxury-features. he film deals with the substance abuse and crimes allegedly occurring in the Indian state of Punjab. Even before its release, it sparked controversy over its untraditional scenes. But, the proper interference of the court helped them to release the film without much delay. The story revolves around a rock star, a migrant worker, a doctor, and a policeman. The film managed to depict the exact picture of the intensity of substance abuse in the state without much exaggeration. Directed by Abhishek Chaubey, the film carries a powerful cast including Shahid Kapoor, Alia Bhatt, Kareena Kapoor, Diljit Dosanjh, and Satish Kaushik. his Bollywood film is a romantic movie written and directed by Vivek Agnihotri. It has extensively captured scenic beauty of the Kashmir valley. The music composed by Ankit Tiwari, Meet bros, and Jeet Ganguly gives additional attractiveness to the film. It is learned that the film crew has had to face a horrific incident while shooting a song sequence in Kashmir when the local persons attacked the crew members for using local girls in the song shoot. Pulkit Samrat, Yami Gautam, Taran Bajaj show complete justice to their characters. The renowned cinematographer, Attar Singh Saini, has successfully given each and every scene a classy touch. his Hollywood film is a comic crime-thriller. It depicts a rare combination of an accountant’s number-skills and a CIA agent’s action-skills. The film showcases several comic sequences along with mind-blowing action scenes. Dwayne Johnson, Kevin Hart, Brett Azar, Megan Park, and Bobby Brown play justice to their respective roles. With the directorial skills of Rawson Marshall Thurber, the film used its strength optimistically and hidden its weakness creatively. Kevin and Dwayne show good chemistry in the combination sequences. The critics warn the movie is an extreme comic drama, and it won’t make sense unless you possess a good sense of humour. his Hollywood horror thriller possesses all standards of a sequential film. The director, James Wan, has managed to maintain the standard of the conjuring series. Through the language of fantasy, the film is taking us into a supernatural world. The story revolves around Ed and Lorraine, two paranormal investigators, and their untraditional investigations. The film is backed by a huge cast, including Vera Farmiga, Patrick Wilson, Madison Wolfe, Frances O’Connor, and Bonnie Aarons. Unlike its predecessors, this time the new sequence gives more importance to its storyline. he fiction novel revolves around a narcotics detective, Eddy Harkness, and his investigation about a deadly heroin. The investigation leads him into the corrupt administration run by a criminal mayor and his illicit gang members. It is the latest among the Bostan crime series, which enjoys good reputation globally. The writer extensively used his written skills to keep the enthusiastic element throughout the story. Interestingly, the story creatively utilised different characters to give a life to the unusual story line. You might find a strong, attractive, and impressive character in Detective Harkness. t is the latest and final of the New York Time’s best seller detectivetrilogy. The series began with Mr Mercedes. Later, Mr King wrote ‘Finders and Keepers’ which became an instant success. The thriller story will take you to a ride into crime, revenge, and unusual world. The story revolves around Brandy Hartsfield, a serial killer, and Detective Bill Hodges. Mr King used his narrative skills to maintain the toughness throughout the story. He includes numerous ‘twists and turns’ to create confusions and tensions. It is worthy to read. his non-fiction book takes us back to the Second World War by discussing the strategies used by Franklin Roosevelt and Winston Churchill to operate allies’ force. It clearly narrates about foreign policy, disarmament policy, invasion strategies and many more. The writer managed to include several facts and reasons to explain his argument. He included several interviews and quotes in his book. Among them, Roosevelt’s cousin Daisy Suckley’s quote was most commendable one. Even though the book shows a proRoosevelt character, unlike other pro-US books it does not criticise any other allies’ leader for any political action. his non-fiction book deals with US military life. It gives scientific explanations about several reactions and actions of the military persons. It is a research material. Ms Mary Roach assures that once you read this book you would not approach any soldier with a prejudiced mind any more. The writer spent time with US army personals to grab some concreate materials for her book. She made a detailed research about hearing loss and survivability in the military combat actions. The book is promising a different reading experience. It welcomes you to untold dimensions of a military life.